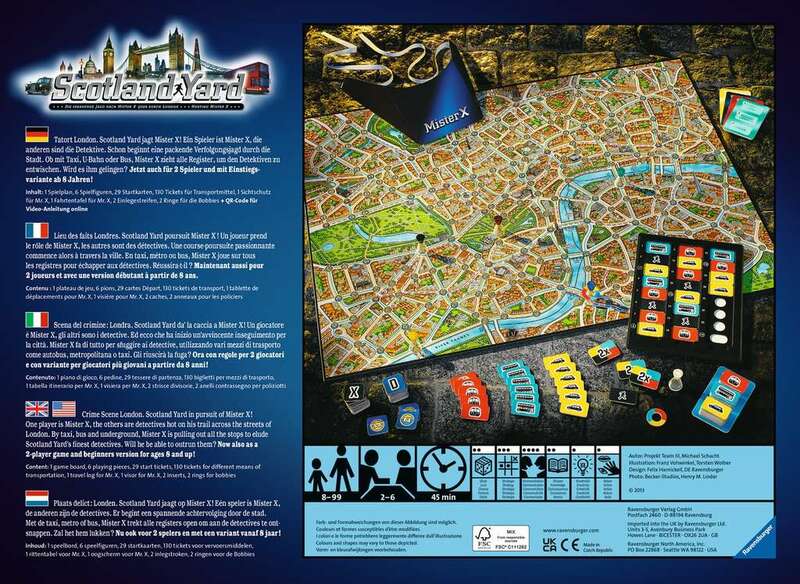 It’s a covert game of cat and mouse set on the streets of London! 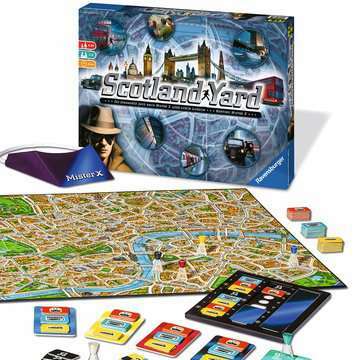 Criminal mastermind Mr. X has escaped Scotland Yard and it’s up to you, the detectives, to catch him! Use your travel tickets to anticipate his movements, chasing him by taxi, bus, and underground, around Picadilly Circus, along the River Thames, and through Paddington Station. 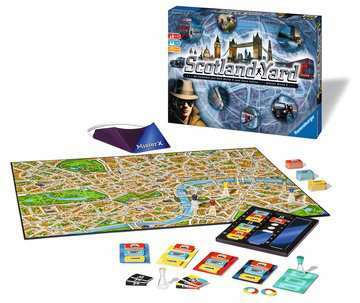 Will you apprehend this dangerous criminal or will he disappear in the London fog? 1. Choose a Mr. X and give that player a player piece, travel log with cover, and special travel tickets. 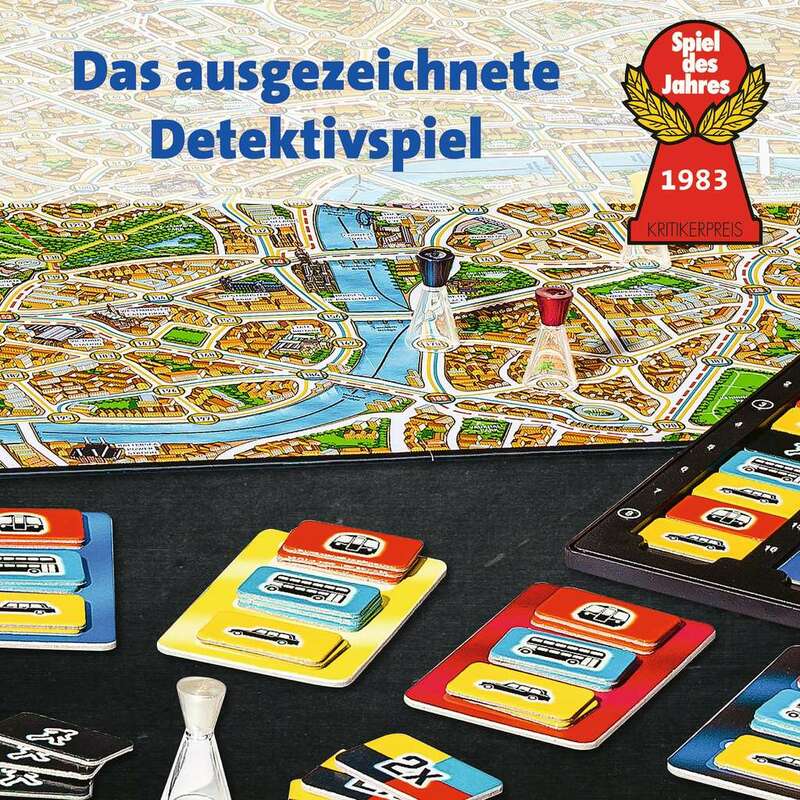 Give the remaining players – the detectives – their player pieces and travel tickets. 2. Players draw cards indicating the number of the station where they will begin play and place their player pieces on those stations. Mr. X draws a card indicating his starting space and notes it in his travel log without placing his player piece there. 3. Players take turns selecting the appropriate travel tickets (taxi, bus, underground) to move them from station to station, anticipating Mr. X’s arrival. Mr. X notes his moves in his secret travel log, surfacing only on specific moves but revealing the ticket he uses to get to his next undisclosed location. 4. Players work together to anticipate where Mr. X will surface next and beat him to that station. 5. If a player piece is on the station Mr. X noted in his secret travel log, that player wins the game. If all players use all travel tickets without capturing Mr. X, Mr. X wins the game.